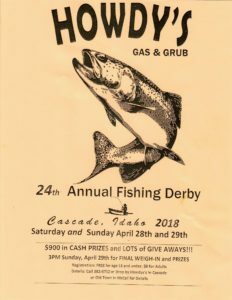 Howdys 24th annual Fishing Derby. Located in Cascade valley’s stunning mountain range, the 4 Summit Challenge course on the last Saturday in July covers some of the most beautiful terrain in Idaho. 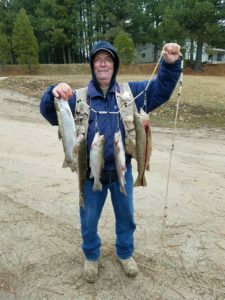 The ride starts at the American Legion Hall in downtown Cascade and proceeds down Main Street to Warm Lake Road. 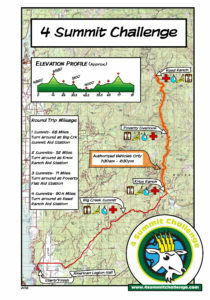 From there, riders can choose to ride 1-2 summits or 3-4 summits–up to 90 miles round trip–to return to the Legion Hall. The entire course of 90 plus miles goes up and over two passes (both sides make it four summits) one of which is on Warm Lake Road–Big Creek Summit and then turning left from WL Road onto the scenic South Fork (of the Salmon River) Road. Along South Fork Road, a participant will go up and over Poverty Overlook and then turn around at Reed Ranch to do the same route again from the opposite direction. Please note that a cyclist that wants to do the entire distance should reach Poverty Overlook before the cut-off time, which is based upon weather conditions. This challenging course attracts cyclists from a wide variety of locations and includes up to 400 riders.